A little while ago I promised a post on my favorite tools for mini work, and here it is! To say I put a lot of work into this post….well, that would honestly be a lie. There wasn’t a ton of work here, because there wasn’t even a lot of thought – when it comes to my favorite and necessary tools, it’s pretty much a no-brainer for me. I’m a huge fan of my utility knife. Not only is it extremely inexpensive, but the blades are also really, really cheap – AND they are dual-ended so you can flip them over instead of just replacing them first. Keeping a sharp blade on it is essential for good cuts, but again, it’s not hard. It’s amazing for foam core, balsa, cardboard, chipboard, craft foam, and anything else I might need to cut. 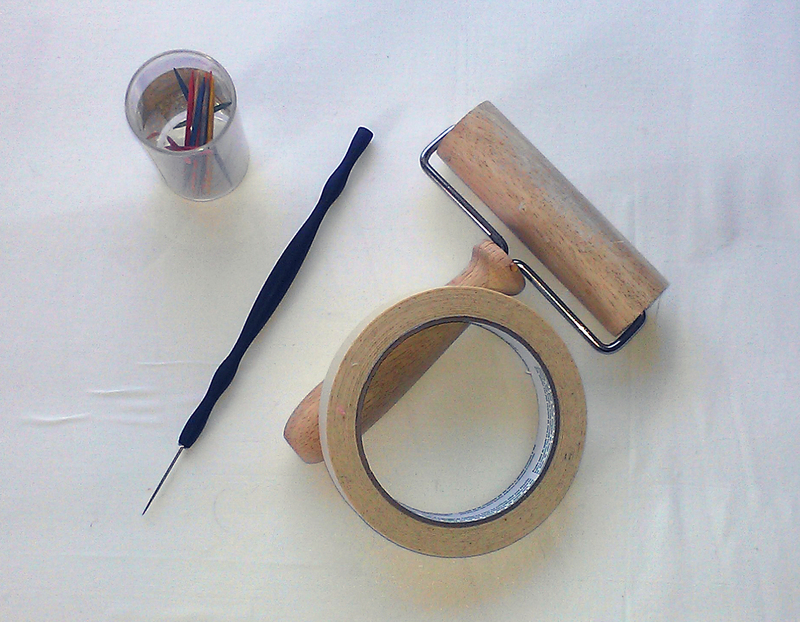 I’ve also been known to use it for fabric and even paper when I need small, precise cuts. I’ve found two rulers to be extraordinarily essential. 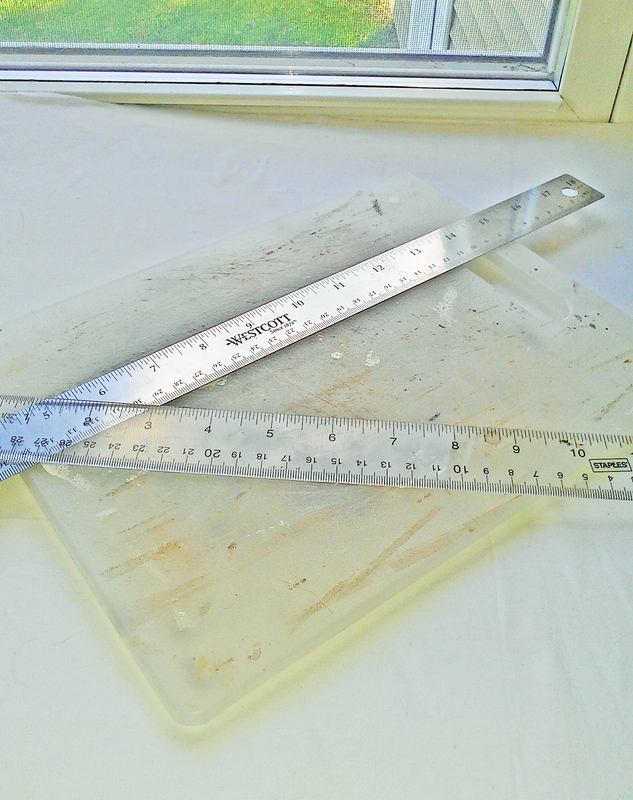 The top one is clear plastic, which allows me to see the material underneath for more precise measurements. The bottom one is stainless steel and 18″ long, providing an excellent straightedge for long cuts as well as better measuring for larger pieces such as the walls of my Undersized Urbanite build. The grungy surface under those is my cutting board. It’s a $3 plastic cutting board from Walmart, and it’s lasted me over 3 years at this point so I’d say it was a worthwhile investment 🙂 It is awesome for painting small items, gluing things together, and of course cutting things. Paint and glue come right off, and it’s ultra-portable – I’ve been known to glue fragile pieces together on the board, then move it somewhere to rest undisturbed. Or even move my painted pieces into the sunlight on the porch for faster drying! Perhaps one of my favorite things about it is the plastic surface allows for me to peel off any dried glue or paint that disrupts the flat surface. Sanding paper is an obvious choice, but emery boards are amazing for sanding small pieces. I don’t know how long I’ve had the package I’ve been pulling them from, but after several years of crafts and fingernails, it’s almost time to get a new package. Ha! What are the little things with colored handles? Jewelry tools. Seriously. These are awesome. They provide very fine grit sanding in teeny little places; they are also great for when you need to widen a hole in a bead (which, surprisingly I’ve had to do several times after I purchased them!). My favorite use for them so far is digging channels to hide wires in wood and MDF. They just make it so easy! 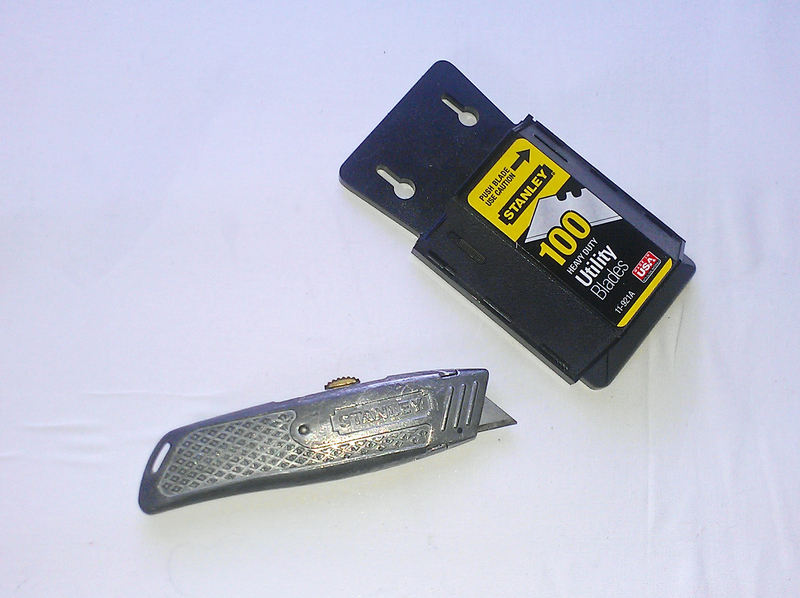 I carve a small line/channel with my utility knife, and then use these to widen it enough to completely hide a wire. It’s that simple! Okay, so these aren’t really clamps. But they are helpful. 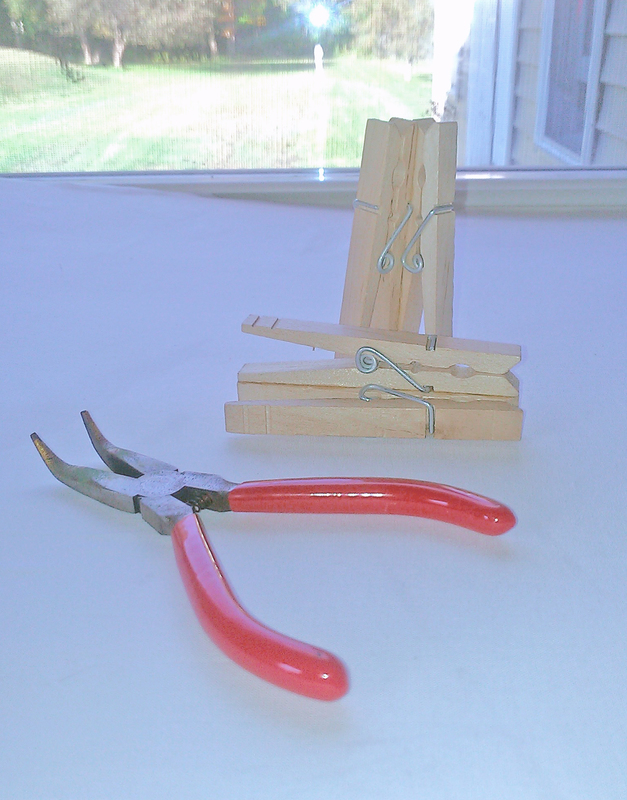 Aside from regular clothespins to hold things together, the pins you see in the picture are actually two clothespins glued together to hold right-angle joints. Very inexpensive, very effective, very easy! I use wood glue when I make them for the strongest bond possible. The only drawback is they cannot be used on softer materials (i.e. balsa or foam core) because they leave dents. But I also generally find those materials are lightweight enough that they can stand on their own while drying. I’ve also included a pair of bent-needlenose pliers, another jewelry tool. These are incredibly handy when I’m painting tiny things, especially because I am very impatient and tend to just rush painting processes. The tips are actually covered in several layers of paint from the last project I used them for – painting six sets of game pieces for a custom RISK game I printed up for my husband! These are somewhat random tools but super helpful nonetheless. Of course I’ve included toothpicks for helping with pinpricks of glue or paint, but the black-handled tool is also very helpful. 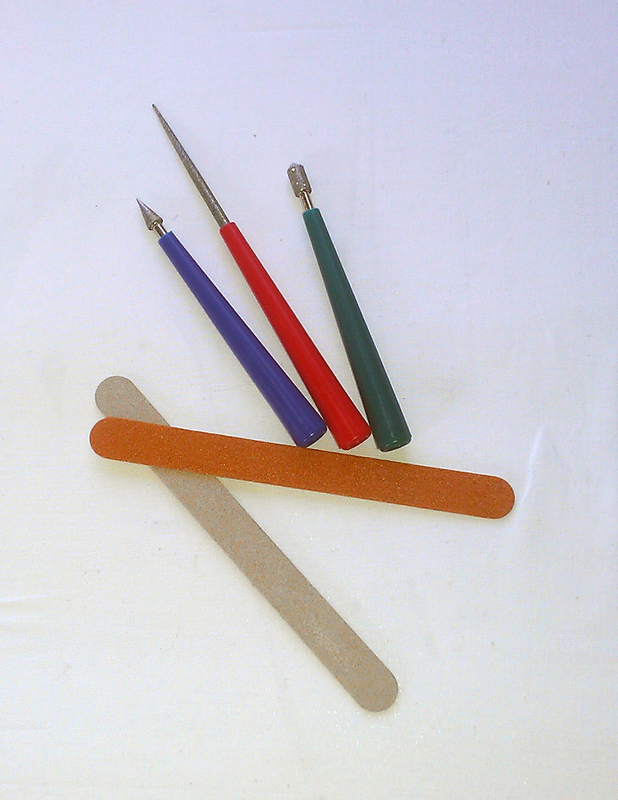 It’s generally used for clay sculpting, but it has been invaluable for several things: small bits of glue, pinpoints or very thin lines of paint, and best of all putting holes in softer materials. It’s also been great to help with small beadwork, because it can easily poke through bead holes to help pick them up. And finally, a clay roller is also very helpful. Not just for rolling out very thin sheets of paperclay, but also for flattening wallpaper when it’s put onto a wall, and for helping to straighten out wood when it warps after gluing or painting. It’s best to do that for things that are still damp, because once they dry it’s nearly impossible. Nonetheless, it is an extremely useful tool. I’ve also been known to use it to press hems and seams on mini sewing work when I don’t feel like pulling out an iron! So, there you have it! What do you think? Any tools that really surprise you? What else would you add to this list?